TechnoProzium: Microsoft offers coloful redesigns: (and) It's not Win8 we're talking about! Microsoft offers coloful redesigns: (and) It's not Win8 we're talking about! series of mice are quite impressive products. 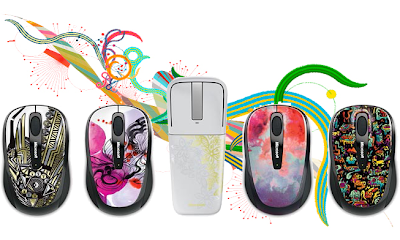 But it seems the MS hardware team wants to take things one step further by expanding the collection of its Artist Edition mice. This includes five new texture designs for the Touch, Arc Touch and Wireless Mobile line-ups. According to Microsoft, these new texture patterns are inspired by the actual works of five artists from different parts of the globe. Quite classy eh? Well, that depends on the artistic sense and taste of the user I guess. But it'll be fair to say that some of these sure looks attractive. 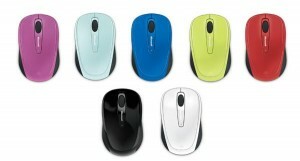 Meanwhile the The Explorer Touch Mouse and Wireless Mobile Mouse 3500 also get some fancy treatment and will be available in an array of different colors like Aqua Blue, Citron Green, Flame Red to name a few. 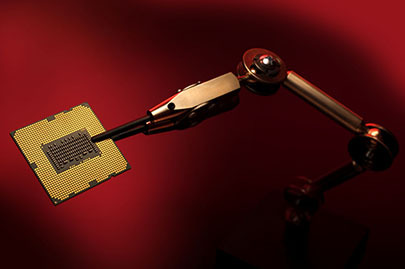 The thing with peripheral devices is that it always boils down to the user's preference. Even more so when it comes down to the aesthetic features. Everyone has his/her own argument about how their mice/keyboards should look like. While we're sure the hack 'n' slash guys out there would've liked a skull mark or two and Skyrim fans would've appreciated a Dragon-scale texture instead of these abstract imageries, these are no gaming mice. 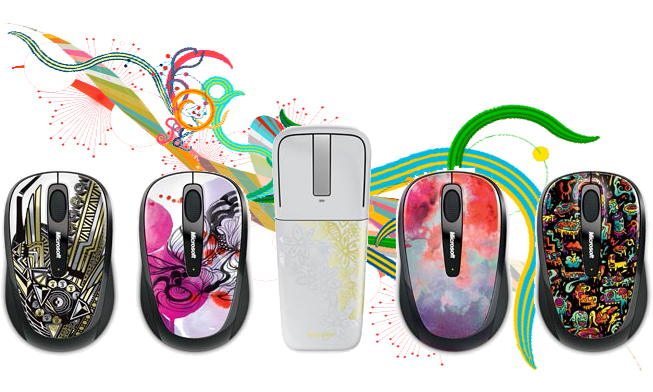 These are normal mice to do your day-to-day works like office, surfing, browsing and maybe some occasional gaming. Having artistic patterens and matching colors won't add to the basic functionality of these devices but surely would add to the visual appeal of your desktop or laptop PCs and Macs. Yes, some of these mice are also Macintosh compatible. So, if you like what you see and fancy one of these, you can get more info and details here. Microsoft's online stores generally have a good selection of peripherals and if you feel safe enough, you can do your shopping there. For myself though it'll take something more than these cute little things to complement my Sidewinder X6.